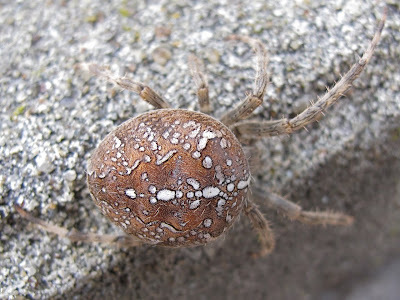 Some individual garden spiders, familiarly installed in strategic spots in the garden have disappeared in the last weeks, probably after laying their eggs and spinning a cocoon around them in a safe, dry corner. I came across this magnificent female, going on a walkabout. The largests I've seen (a 1 p coin for comparison). For those people not used to UK coinage, a 1p coin has a diameter of 20.3mm (according to Wikipedia). That's a beauty! 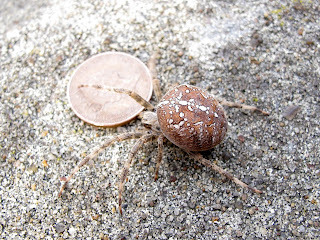 This one (last image) is the most fabulous garden spider I have seen - was enormous too.